Warwick Rotary Club was delighted with the large turnout at last weekend’s 14th Thai festival in Warwick. 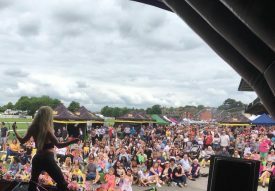 The warm weather, and free parking ensured that thousands packed Warwick Racecourse over two days, enjoying Thai dance and ladyboys, local Muay Thai kick boxers, and a range of exotic Asian foods and Thai crafts. The Thai festival is now a regular at the racecourse, and with a new partner Magic of Thailand, has found a winning team. Organiser, Rotarian Alan Bailey, explained that the event raises funds for local charities and international disasters and is a great opportunity to showcase Warwick to a wider community. Rotary President John Hibben and Cllr Richard Eddy, Mayor of Warwick welcomed visitors from all over the UK, and even Canada! Little ones enjoyed the play area and getting their faces painted, and the nearby Leycester House care home brought residents for a day out. Many visitors carried on to explore the rest of the town, returning to eat and relax in the sun and join in the dancing. Prayers and blessings by Buddhist Monks added to the atmosphere. The festival was sponsored by Kia Cars, Costco, Tourist Authority of Thailand, Singha Beer, and Eva – Air who ran a raffle donating free flights to Thailand. 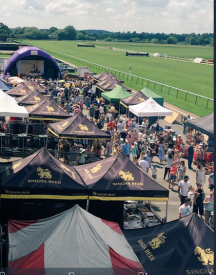 Warwick Racecourse organised the ticketing and opened its facilities, with staff assisting organisers throughout the weekend. CJ Events provided the stalls, the 2nd Warwick Sea Scouts helped park all the cars for 2 days, and Warwick Ambulance and Warwick Lions were in attendance. Magic of Thailand brought all the artists and stall keepers, and this is the first of 8 festivals they are arranging around the country this summer. Andre Klein manager at the racecourse said they were pleased to support the community in this way, and he thought nearly 6,000 people had attended the Festival.